DPG1U Series 1U GMT fuse panels provide distribution and overload protection for 10 or 20 circuits. The 1.75 inches high GMT fuse panels provide 10 or 20 single-bus fuses or 20 dual-bus (A&B) fuses (10 per bus). DPG1U Series 1U GMT fuse panels distribute up to a total of 160 amperes of load current from two separate 80-ampere sources with true A and B distribution and alarm capabilities. A and B sections of the dual-bus panel are isolated and can be separately configured for 12, 24 or 48 volts and are polarity neutral. Fuse sizes are ½ to 12 amperes. Alarms are indicated by a dual-color LED (green/red) and one Form C relay contact per bus. 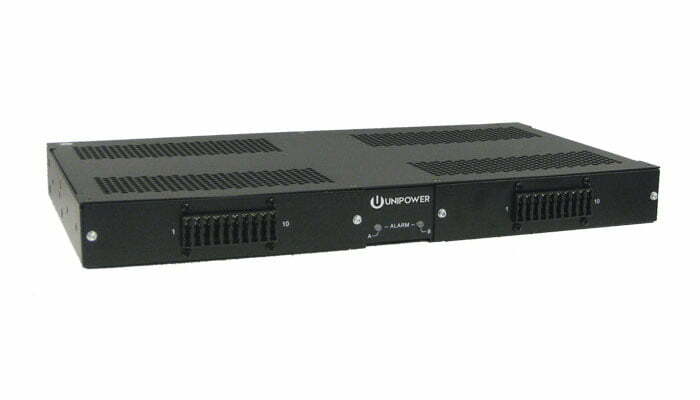 DPG1U Series 1U GMT fuse panels are supplied with brackets that permit mounting in either a 19- or 23-inch relay rack. They can be mounted from the front of the rack with offsets every quarter-inch from front to back to align with existing rack-mounted equipment. Note: ‘x’ denotes the operating voltage.